The Makkah Clock Tower is one of the numerous projects that Pan Gulf Industrial Systems (PGIS), a wholly-owned subsidiary of the well-diversified Pan Gulf Holdings group and newly formed Pan Gulf Industrial Investments Company (PGIIC), has carried out in Saudi Arabia. 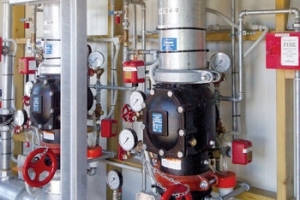 Victaulic technology proved to be a dependable solution for fire protection at one of New Zealand’s largest cold storage facilities lo-cated at Auckland International Airport. Currently under lease to a global cold storage company, the Auckland warehouse is part of a global network and works on 24-hour time for demand and delivery. BASF’s expanded polypropylene foam Neopolen P reFLAM, tested in an institution certified by the aviation industry in accordance with the specification CS25.853, is approved for moulding densities from 36g/l to 75g/l in accordance with applicable requirements.